Echoes of the Past, Epics of Dissent, the story of a South Korean social movement, offers a window to a decade of tumultuous social protest in a postcolonial, divided nation. 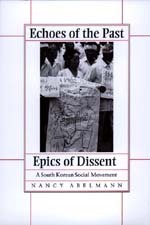 Abelmann brings a dramatic chapter of modern Korean history to life—a period in which farmers, student activists, and organizers joined to protest the corporate ownership of tenant plots never distributed in the 1949 Land Reform. From public sites of protest to backstage meetings and negotiations, from farming villages to university campuses, Abelmann's highly original study explores this movement as a complex process always in the making. Her discussion moves fluently between past and present, local and national, elites and dominated, and urban and rural. Touching on major historical issues, this ethnography of dissent explores contemporary popular nationalism and historical consciousness. Nancy Abelmann is Assistant Professor in the departments of Anthropology and East Asian Languages and Cultures at the University of Illinois, Urbana-Champaign.